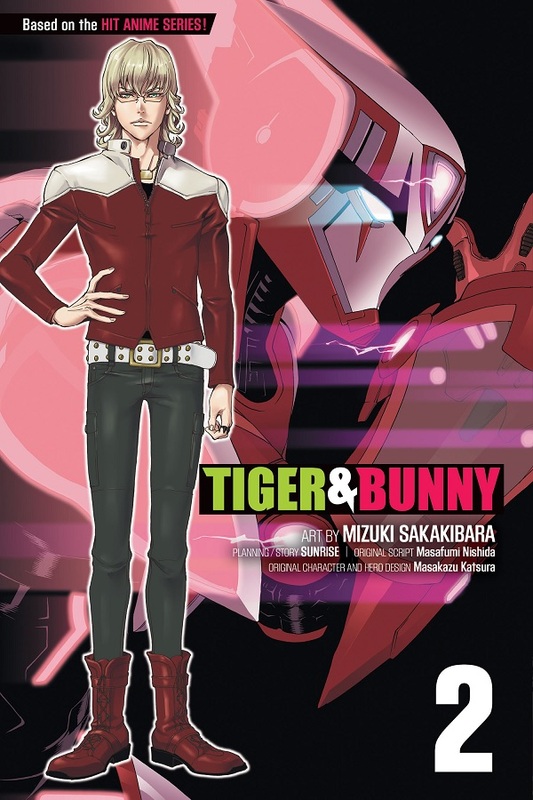 Since the first release of Tiger & Bunny in North America in February, Viz Media has also started bringing the manga for the series over as well. So far with Volume 1 we’ve seen that the story follows that of the anime very closely much to its benefit. Now with Tiger & Bunny Volume 2 hitting stores, does the manga successfully take the greatness of Tiger & Bunny and translate it into print? When we last left the heroes, veteran hero Kotetsu had been forced to partner up with a rookie with the same abilities as him called Barnaby after Kotetsu’s sponsor was purchased by another company. The two reluctantly began working together but thanks to their conflicting styles and work ethic, Kotetsu prioritizing the safety of the public and acting on instinct while Barnaby cares only for television time and points, the two were off to a rocky start. This second volume picks up after the events of the ice-rink and slows down the pace a bit to focus on the characters and their relationships with one another. There is a bit more focus this time around on building Kotetsu and Barnaby up as a partnership, but their conflicting personalities and Barnaby’s inability to see Kotetsu as anything more than a burden continue to drag their working relationship down. It is worth noting that the manga continues to cover the material from the anime very closely and this volume actually contains the events that occur during the third and fifth episode of the anime, while the events of the fourth episode are mostly glossed over. The comedy that comes from the odd couple of Kotetsu and Barnaby continues to be the highlight throughout the manga, though this volume is more action and background oriented than the former. There are a few new scenes and reactions included in the manga, but for the most part a number of scenes are skipped entirely and while Blue Rose and Kotetsu’s background are explored a bit throughout this volume and more of Barnaby’s past is revealed, there is a certain rushed feeling to the events portrayed in Volume 2. The illustrations handled by Mizuki Sakakibara remain very impressive with the heroes outfits being nicely detailed and with a great deal of effort put into make sure the characters’ faces are expressive when they are out of their suits. The lack of sponsor placement remains consistent throughout the volume which means that, outside of Origami Cyclone’s focus on sponsors, they will likely remain omitted throughout the manga series. As far as the backgrounds go, there are a few nicely detailed scenes and a number of two-page spreads including the debut of Tiger and Barnaby’s “Good Luck Mode” which is nicely detailed on paper. It is worth noting though that unlike the previous volume, there is an overabundance of plain or empty backgrounds used in panels. Again Viz has impressed with their work with the manga’s translation and handling of the text. Each sound effect has been translated into English and the insertion of the English text hasn’t damaged the original artwork in any way even when the text is inserted over the image itself and not within a basic voice bubble. This second volume is unfortunately rather barren as far as extra inclusions are concerned. When readers open this volume there is a nice color page featuring Kotetsu and Barnaby in kimonos and a small image of Blue Rose also in a kimono. Outside of that there is a minor color image following that with a basic image of Kotetsu and Barnaby in street clothing and the volume closes out simply with a preview of what readers should expect in Volume 3. With the second volume of the Tiger & Bunny manga the status quo seems to be established as far as the artwork goes with impressively detailed character outfits and facial expressions, though the backgrounds in later have suffered. While told in a slightly altered way, the story of Tiger & Bunny continues to be nicely handled in this manga adaptation, even if it skips a number of scenes without much in the way of new additions.